Home » Calling NTTs! FSU Job Opportunity—Last Chance! The FSU is looking for an NTT faculty member to be an internal organizer for the union during the Spring 2019 semester. The organizer, working closely with FSU leadership, will be heavily involved in activities to support FSU initiatives, including membership campaigns and communication infrastructure. These activities will include campaign planning, talking to members one-on-one, developing messaging and materials, and organizing meetings. 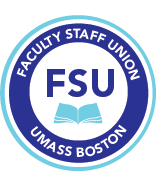 The FSU will buy out one course of the faculty member selected, or if the faculty member is less than full-time, pay the faculty member the equivalent of one course in salary, so that 25% of time/effort can be devoted to organizing for the FSU. Either way, the amount of work will be about 10 hours per week over 15 weeks. If you are interested, please submit a short statement introducing yourself and any relevant experience to fsu@umb.edu preferably by tomorrow, Friday, November 30,th by 3 pm.